EDITOR’S NOTE: In May of 2015, Pope Francis signed a treaty formally recognizing the enemies of Israel, the mythical state of Palestine. 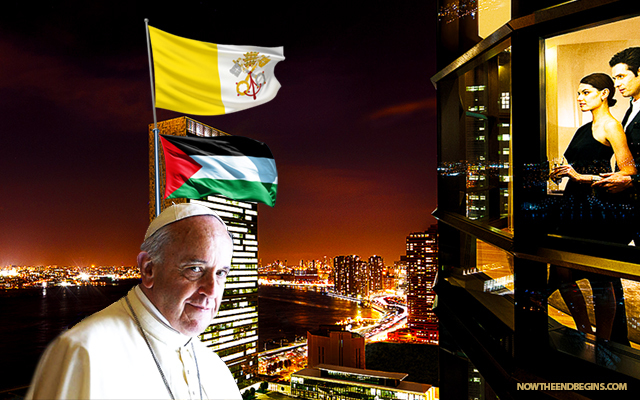 This week, when he arrives to take over the United Nations, the twin flags of both Vatican City and Palestine will be raised in symbolic conquest for the first time in the 70 year history of the UN. Wait just a minute! Did someone say “70 years”? Just ask the prophets Jeremiah and Daniel about the importance of the number 70 in fulfilling Bible prophecy. Catholics and Muslims, conquering the world in the name of their end times god. Things are about to get very interesting. UNITED NATIONS – A United Nations official confirms that the flag of Vatican City will be raised for the first time outside U.N headquarters the morning of Pope Francis’ first visit. It is a turnaround for the Vatican, whose U.N. ambassador has said it had “no intention” of raising the flag before the pope arrives Sept. 25. The False Prophet is raising his flag over the United Nations in a sign of conquest, and also that of the mythical nation of Palestine. The enemy of the Jews will be out in full force this week. The United Nations General Assembly last week overwhelmingly approved a Palestinian proposal to raise its flag and that of the Holy See as the U.N.’s two non-member observer states. The Palestinians have announced a ceremony for their flag-raising Sept. 30 during the annual U.N. gathering of world leaders. But the Holy See flag is set to be raised quietly. The official spoke on condition of anonymity because they were not authorized to talk publicly about the event.